This is a table that I made 15 years ago for a designer here locally. The table was designed to have their last name initial “W” cut into the two sides of the table top in opposing woods. I cut all my own veneers at 1/8” thick for the entire top and used the Bevel cutting method for cutting marquetry. The center post of the table is a Queen glued up in two woods Maple & American black walnut. A while back I got a call from a couple that has purchased the table at an estate sale. The new owner wanted a custom checker set made to match the style of the table. Which for me was a really great phone call because I never took any pictures back then of this table. When I delivered the checker set she let me take a few pictures. The table was sitting in a small game room. It was a little damaged with some chair scratched lines on the legs and it was a little sun faded on the top but over all I was very happy to see how all my joinery and marquetry had held up throughout the last 15 years. So another 85 years and it will be a true antique I hope that it makes it. Well the pictures are not the greatest but at least I got a chance to take a few shots! Thanks for looking! Here is a link to the very first completed set that I made 16 years ago, time really does fly. An incredible piece that deserves an honorable spot in one’s home. Great looking piece Dennis. Nice job then and now. Loved the legs and center piece. Great opportunity to see how your work survives after it’s gone. Oh yeah and got another commission! LOL! We loved your story. It is wonderful when your work comes back to honor you! I’m afraid mine might come back to bite me! The table is really wonderful. 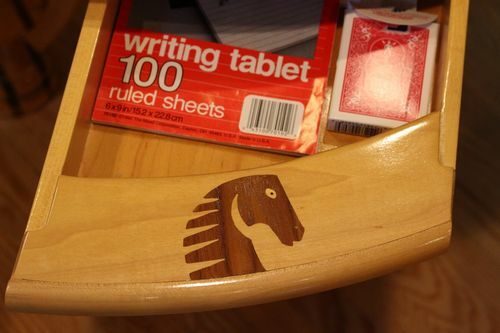 We can’t begin to imagine all the precision work involved. So nice you could get a picture now. Not only its it beautiful, but it is really cool! Awesome work Dennis. Thanks for posting the pics. Love it !!! Best marquetry I’ve seen. Awesome everything! Beautiful piece Dennis and it goes to show that the good stuff never becomes outdated. 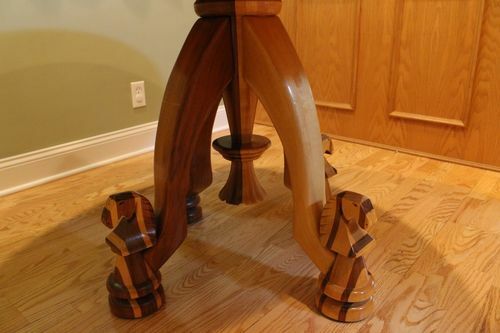 Wow Dennis, what an amazing table, awesome inlay work and design, really like the legs and feet and the centre piece under the table…My favorite for the day, you have amazing skills. Thanks for sharing. Amazing workmanship! Looks fantastic and love the details on the legs, great job!